On August 2, the Franciscan family celebrates the Dedication of the Chapel of St. Mary of the Angels. It is known as the Portiuncula or “Little Portion,” restored by Saint Francis and the place where he and the early Friars made their home. Likewise, the Chapel is the place where Francis received Clare into the “movement” on March 28, 1211 and where he died in 1226. Based on mystical vision St. Francis experienced of Jesus and Mary in the Portiuncula chapel on August 1, 1216. The Little Portion Chapel, thereafter, has been the site of a venerable tradition of being a place of forgiveness, indulgence, justice and mercy. 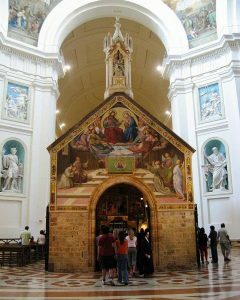 One of the traditions of today’s feast day is for pilgrims to the Portiuncula for the Feast of Saint Mary of the Angels may pray for the “Pardon of Assisi” or Portiuncula Indulgence, granted to all those who come to this chapel seeking reconciliation and are repentant of sin. This plenary indulgence may ordinarily be gained between August 2 and 15. However, the Indulgence is granted today to anyone with the intention of honoring Our Lady of the Angels reciting the Creed, praying the Our Father, Hail Mary, praying for the pope’s intentions, along with fulfilling other conditions (of receiving forgiveness of sin). 2016 is the 800th anniversary of the granting of this Indulgence. We are honoring the memory of St. Bonaventure of Bagnoregio (ca. 1221-1274) today. One of the great scholastic theologians and pastors of the Church. I hope the Thomists won’t get mad! There are many who make the claim that the best general introduction to the thought of Bonaventure is Sister Ilia Delio’s, Simply Bonaventure (New City Press, 2nd ed.) And I agree. But if you need another resource, consider this encyclopedia entry (2005/2013). 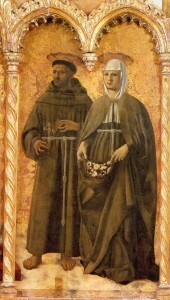 Bonaventure, having joined the new movement of Friars in Paris, his priestly and academic career was centered at the Franciscan School of Theology at the University of Paris from 1248-1257. By this time he garnered the attention of his brothers and churchmen at large. He was elected General Minister of the Order governed his brothers for 17 years. It may be said that after the early days of Francis and the early leadership of the Franciscan movement Bonaventure makes his Order credible and and reliable. Thereafter, Bonaventure was elected to serve the Roman Pontiff as Cardinal-Bishop of Albano and expert at the Second Council of Lyons; At Lyons, he died during the Council. 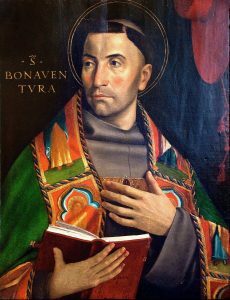 The scholarship on Saint Bonaventure reveals to us that he emphasized all learning must serve the ultimate goal of human life: communion with God. His work is greatly trinitarian and Chriwstocentric. For him, and for us, Christ is the one and true Master! This is a critical point for knowing today’s saint: learning is not meant for self-aggrandizement but to help a person realize that he or she is on a journey toward union with a loving God –a communio theology. You could say with seriousness that to do otherwise is to reduce theology and learning to absurd levels and miss the point of knowing, loving and serving the Blessed Trinity. whose purity cannot be disturbed. This image of Saint Bonaventure, is depicted by the Veronese painter, Paolo Morando Cavazzola (1486-1522). 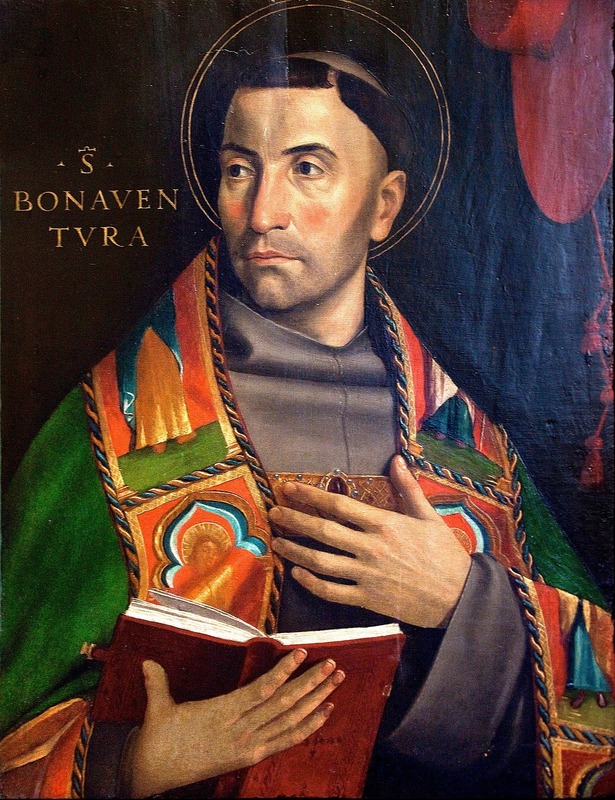 Few medieval depictions of Bonaventure exist; Bonaventure was not canonized until 1482. 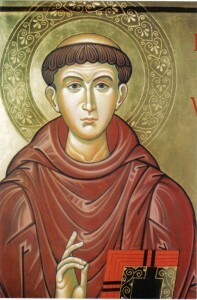 St Anthony of Padua (1195–1231), a Doctor of the Church, carries the nickname of “the ark of the covenant” for his deep knowledge of sacred Scripture and the ability to do great things for God’s Kingdom: drawing large crowds –including animal life– to hear his preaching, inspiring countless souls to amend their ways, and gave true Catholic teaching by the strong argument of miracle as well as of doctrine. As the Ark of the Covenant, St Anthony challenged the false teaching about God and human beings and called his hearers to right teaching, right living, right relationship with God, the Lover of Humanity. In Abbot Prosper Granger’s monumental work, The Liturgical Year, conveys this prayer: O thou who dost daily fly to the aid of thy devoted clients in their private necessities, thou whose power is the same in heaven as heretofore upon earth, succor the Church, aid God’s people, have pity upon society, now more universally and deeply menaced than ever. O thou ark of the covenant, bring back our generation, so terribly devoid of love and faith, to the serious study of sacred letters, wherein is so energizing a power. O thou hammer of heretics, strike once more such blows as will make hell tremble and the heavenly powers thrill with joy. Elizabeth was the daughter of the King of Hungary who at the age of four was sent to be raised with her future husband, heir to the country of Thuringia, at the Wartburg Castle, near Eisenach, Germany. Elizabeth’s heart was always drawn to prayer and works of charity. As a consequence of good preaching, teaching and good example, particularly her education in the ways of Saint Francis, Elizabeth’s compassion for the poor grew and was extroverted. The presence of dynamic Franciscans in Eisenach was a good help. There seems to be contradictory information floating around that her husband was against the charitable work of his wife, Queen Elizabeth. The Franciscan tradition actually holds Ludwig in esteem as being loving and supportive of her efforts. When King Ludwig died in 1228, Elizabeth made a consequential gift of self allowing herself to take up the God-given mission of giving all “to the things that our Savior had counseled in the Gospel” and by placing herself under the spiritual authority of the Franciscan friars at the church in Eisenach. She dispossessed herself of her material belongings and devoted herself to the care of the sick in a hospital she had established in Marburg. Queen Elizabeth died at the age of 24, and was canonized in 1235. Saint Elizabeth lived out Holy Father Saint Francis’s call: “Let us love our neighbors as ourselves . . . Let us have charity and humility and give alms because it washes the stains of our sins from our souls. For although people lose everything they leave behind in this world, they, nevertheless carry with them the rewards of charity and the alms they have given, for which they will receive a reward and a fitting repayment from the Lord” (Admonition and Exhortation, 30, known also as The Letter to the Faithful). With the feast day of Saint Elizabeth, we ought to have a special concern for those Catholics who have as their particular charism the care for the marginalized, those who require hospital care, and other works of charity influenced by Matthew 25. Blessed John Duns Scotus is liturgically remembered today but because it is Sunday his memorial is skipped this year. Sad really. As you know, Blessed John was born in Scotland in 1266, studied and taught in London and Paris and spent the end of his life in Cologne having died in 1308. His sarcophagus in the Minoritenkirche. 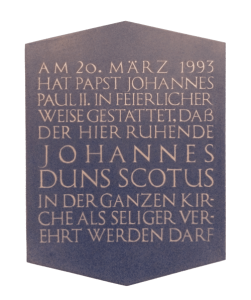 At Scotus’s sarcophagus is the plate showing us that he was declared to be “blessed” when John Paul II visited Cologne. Blessed John is widely known as the high point of medieval philosophy. 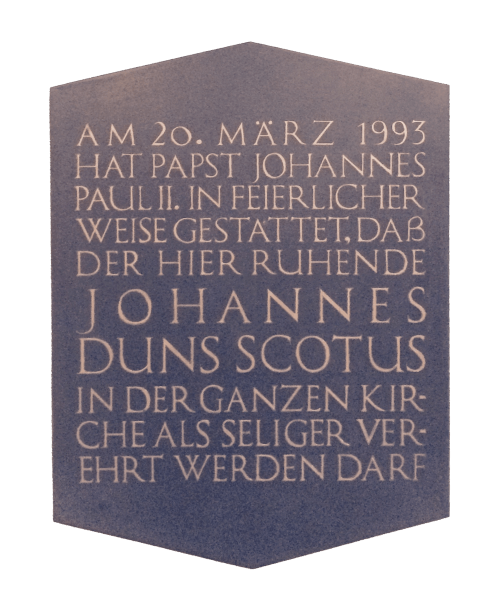 Martin Heideggers did his second doctorate to teach in the university (the “Habilitationsschrift”), on a topic from the philosophy of John Duns Scotus. The modern era of philosophy is credited for being full of errors, especially for the errors of modernity (the univocity of being). Blessed John seems to be at the heart of the controversy. Philosophically, I remember Scotus for two things: 1.) his exposition on the Blessed Virgin Mary and 2.) haecceitas. It was his work, the year before his death, on the Virgin Mary that led the Church under Pope Pius IX to define the dogma of the Immaculate Conception. On this second point develops a theory of haecceitas, or this-ness –the metaphysical cause of individual being. Haecceitas speaks to what makes this rhubarb (or cat or dog or human being) different from that other plant (or car or dog or human being). This metaphysical cause was picked up by Jesuit Father Gerard Manly Hopkins in his poetry. At any rate, Blessed John’s philosophy is not what he’s liturgically remembered for, it is his holiness of life. Let us pray that Blessed John Duns Scotus mediates for us before the Throne of Grace.